System administrators of the world, if a VM experiences a problem that takes down business-critical application, your job is to get minimize the impact to the business. You are caught in a difficult decision. Do you repair the VM as quickly as possible, but possibly lose traces of what went wrong. In doing so, that loss of evidence might mean that this outage returns at a future point in time. Do you prolong the outage and continue to impact to the business to investigate and get to the root cause of what actually happened so that it does not happen again? The business almost always pushes you to perform the former, which puts you in a bad position if the VM issue returns. For those of you on VMware vSphere platforms, the latest revision of VMware’s PowerCLI PowerShell extensions contain a little publicized feature that allows you to capture the production server’s error state and preserve it for later investigation so that you can repair the VM as fast as possible to minimize the impact to the business. 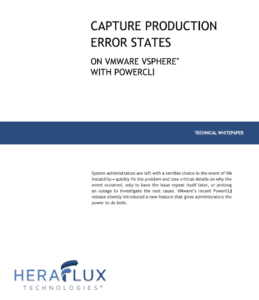 Read more about this exciting new feature and how you can leverage the power of this feature to capture the production error state in our new free whitepaper!